Discussion in 'Mech Tech' started by Mucka, Jun 8, 2014. I bought my R9 from Advanced Fluid Solutions Ltd which is not stamped with a brand. or one last option is to find a suitable nylon fuel line like they use on the modern cars from the tanks to the engine bay. I dont know how this would work with the engine bays heat from a bay. Anyway thats all for now, any thoughts? mcswiggs, MarcT512 and howard64 like this. good topic cheers deffo doing mine with some longer life stuff next year, although for you non injection types it's only a 10 min job, i've got 18 fuel clips in the engine bay alone - and 2 diameters of pipe! think theres around 24 clips? on a f.i van. Diddymen and IZZYBAY like this. We did some tests on fuel line about three years ago for the race team. The ONLY line we could find that didn't suffer degradation was manufacturers OE! In the end we bought a load direct from Yamaha as theirs performed the best. With such a dangerous issue I'm surprised there isn't more regulation on the selling of poor grade hose. 1973daisey, Faust, Colin and 1 other person like this. This would seem obvious to the more sensible out there, never mind straight bananas are a godsend! I’m not impressed with the Flexiducting & Tubing Ltd website where they recommend SAE J30R7 as being suitable for E10 fuel. But at least they supply Gates Barricade – I haven’t previously been able to find a supplier in Europe. SAE J30R6 and SAE J30R7 hoses have a high permeability to Ethanol and should not be used for E10 fuel. I wouldn’t even use it as a breather hose. SAE J30R10 is meant for low pressure applications where the hose is submerged. It should not be used as a fuel supply, especially not for fuel injection. Lasty and SeanOC like this. so what one would you go for in the plethora of options out there @77 Westy ? The flexi duct company is not far from me I will give them a call and see what they have in stock. Regarding the OE fuel lines how would we join them to the existing tank and carb outlets? This guy is one of sponsors, he sells top stuff. IZZYBAY and Grum like this. I used a SAE J30R9 spec hose from Advanced Fluid Solutions about 3 years ago, however, if I could have found a supplier I would have used Gates Barricade (Gates didn’t reply to my request for a supplier in Europe). If I were replacing the hoses today I would still choose Gates Barricade (SAE J30R14) or a 100% biofuel compatible hose. It’s important to select the correct size of hose; it must be stretched over the connection so don’t for example use 8mm bore hose on an 8mm OD connection. It’s also important not to contaminate the outside of the hose during or after fitting – don’t clean it with petrol or any other solvent. Ignore the myth that Jubilee clips should not be used but regardless of the type it is important to select the correct size of clip to suit the hose. Jubilee make high quality worm drive hose clips, they are recommended by hose manufacturers for use in the marine environment and other critical applications. I use them for all the high pressure connections on my fuel injected MGB although I’ve used the nut and bolt type clip on the carbs on my Bay. snotty and SeanOC like this. I always thought the beef with jubilees was how it clamps to the pipe rather than the quality of the worm system. I may well be wrong but the nut and bolt type wrap around the whole pipe making a better seal maybe? 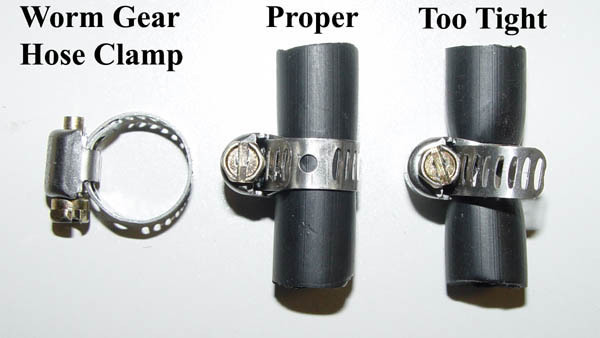 The nut and bolt type clip has the same, or very similar, uneven clamping around the hose as the worm drive clip, neither are perfect, either are satisfactory. The correct size of clip is far more important than the type and the disadvantage with the worm drive is that a clip too large for the hose can be made to seem to be tight when in fact the clamp is excessively uneven, a nut and bolt clamp just runs out of thread if it is too large. I use both types but my preference is the worm drive, especially for a high pressure application. I would never use a nut and bolt clip on the cooling system on my MGB for example and that is only 15psi. moley76 and snotty like this. I phoned up flexiducting today and they don't sell the barracuda line any more. They do still the gates r9 line but it's not stamped with their mark. I bought 4m today because I need to change mine with something, I'll email gates to see if they have a UK seller. Alex VW Heritage likes this. I can’t find the specification or standard for Silflex Profuel but reading the manufacturers marketing hype it would appear to be suitable for E10 fuel with a very low permeability; and apparently it is self-extinguishing in the event of a fire. However, be aware that standard fluorosilicone lined hoses will not resist Ethanol. What do you use Paul? The only issue with that is, is the smallest diameter is 1/4in which is just over 6mm. So too big for our little motors!! Unless there is a chance of getting that manufacture to tool up to do a 5.6mm diameter hose, but then I'd have to buy a drum which will be 50m plus! !